This quiz is for masters, just warning you before you start. HARD. Just saying that if you are not a master you probably will FAIL!! By the way there are several team tens. Have fun with a variety of questions about vocaloid characters and songs. Don't let the questions fool you. The questions vary from Hatsune Miku to Macne nana. What is Hatsune miku's most popular song in her career? Which song did Megurine luka do a music video to? What color of hair does Yamune Remy have? What is the name of the vocaloid team that Miku Hatsune is in? Which team is SeeU on? What is a song macne Nana featured in? Megurine luka wears what outfit in most of her videos. 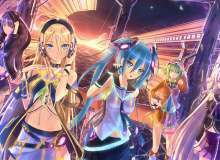 Quiz topic: Do I know Vocaloid! ?